The Appleton Estate Jamaica Rum Prime Ministers’ Reserve barrelling ceremony, held at J. Wray & Nephew Limited’s head office on Kingston’s Spanish Town Road, saw Independent Jamaica’s nine Prime Ministers or their representatives, led by current Prime Minister, the Most Honourable Portia Simpson Miller, ON, MP, pour a 750 ml bottle of the Appleton Estate 50 Year Old Rum Jamaica Rum – Jamaica Independence Reserve, which is a minimum age 50 year old rum that was created to celebrate the 50th Anniversary of Jamaica’s Independence, into a barrel containing rum from the 2012 crop year. The nine barrels will now be set down to age under the careful monitoring of Master Blender Joy Spence, and in later years by her successor, until 2062, when they will be used to create a very special blend of rum to celebrate the 100th anniversary of Independence. “We, the current generation of employees at J. Wray & Nephew Limited, are truly honoured to continue the tradition of honouring Jamaica and her people through the creation of a very exceptional rum blend that has significant historical references for our country. “With the Appleton Estate Jamaica Rum Prime Ministers’ Reserve, we are not just creating a rum blend, we are also witnessing history in the making, as each Prime Minister or their representative poured a bottle of Appleton Estate 50 Year Old Jamaica Rum – Jamaica Independence Reserve into a barrel containing rum from the 2012 crop year. In commenting on the Appleton Estate Jamaica Rum Prime Ministers’ Reserve, Master Blender Joy Spence noted that when the blend is bottled in 2062 it will no doubt be a masterpiece. “I am sure that the Appleton Estate Prime Ministers’ Reserve will be truly exceptional. It comprises rums from the 2012 crop year so in 2062 it will be a minimum aged 50 year old rum. 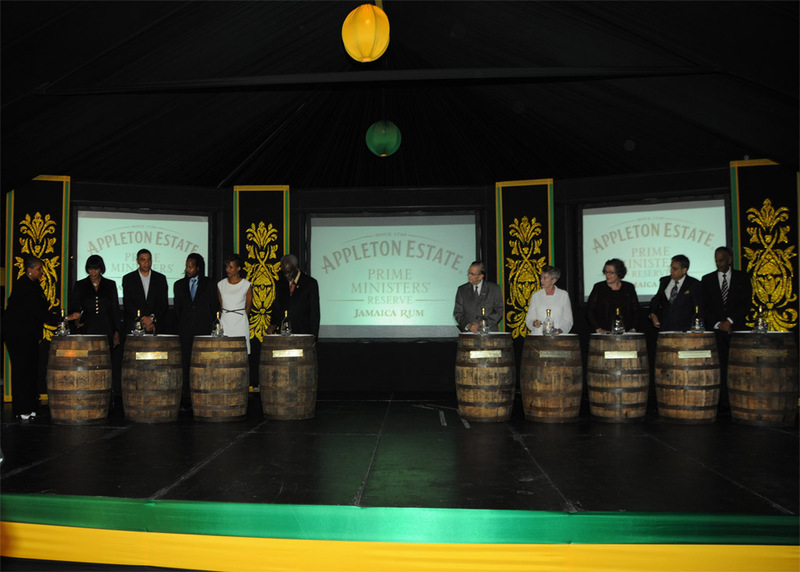 The nine barrels of Appleton Estate Jamaica Rum Prime Ministers’ Reserve will form a permanent display at the Appleton Estate Rum Tour in St. Elizabeth, Jamaica. Each barrel will bear a plaque identifying which Prime Minister filled it, and an explanation of the significance of the Appleton Estate Jamaica Rum Prime Ministers’ Reserve. This means I have 50 years to start saving another 5000 dollars for this rum! Talk about this rum in the forums.